Have you heard? 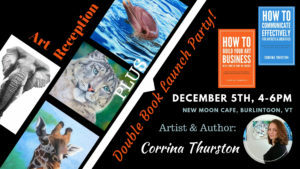 In just a few weeks on December 5th, 2018, I’m having an Art Reception and Double Book Launch Party! But…what does that mean, exactly? What goes on at a triple event like this? 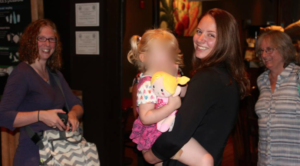 Read on to find out the details! First off, let’s get some of the necessary details out of the way. 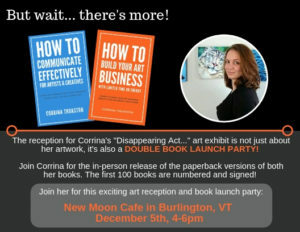 This event is going to be at the New Moon Cafe. This recently renovated cafe has a gorgeous and cozy (but spacious) seating room in the back, delicious food, and warm drinks! It’s located at 150 Cherry Street in Burlington, VT. The New Moon Cafe is conveniently located just across the street from one of the parking garages! You can enter the parking garage on Cherry Street, less than a block from the cafe. The first two hours are free, and then I think it goes to $3, and up $2 for each of the next hours you’re there. There may also be parking available on the street. This triple event will take place on Wednesday, December 5th, 4-6pm. You can RSVP to this event on the Facebook page I’ve created HERE, or you can simply email me to let me know you’re hoping to make it! Email me at: corrinathurston@gmail.com or go to my contact form HERE. You are absolutely allowed to bring friends! If you’ve ever been to one of my art events, speeches, or workshops, you know I’m a relatively low-key person. I like to keep my art receptions that way as well. You don’t have to dress up or come prepared with any “art talk,” instead I want you to be comfortable and relax and enjoy the artwork. New Moon Cafe is a great atmosphere for a reception like this, and as you stroll into their back seating area, you’ll see my pencil artwork framed and lit along the wall on the right. At the reception, you’ll also see me, wearing a black dress and a smile, probably standing by a banner and a table full of fun products featuring my artwork! There’s no rules for my art receptions and I want to make the artwork as accessible as possible, so feel free to walk up close to it to see those tiny details I’m known for, read my artist statement that’s hanging on the wall, and come talk to me about your favorite piece! This exhibit is special because it is the VERY FIRST TIME some of these drawings have been on display! 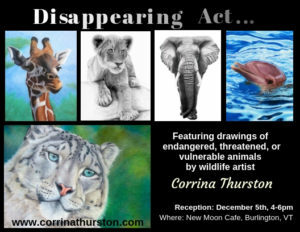 That includes my Black Rhino drawing and my Lion Cub drawing, both of which are part of my current series called Threatened & Endangered. Those two pieces, along with the African Elephant, are the centerpiece of this exhibit! You have to see these drawings in person! But the art reception is only the beginning! Not only will I have a table of cool prints and products featuring my artwork (great gift-sized items for the holidays by the way…hint, hint, wink, wink…) I will also have a table full of BOOKS! 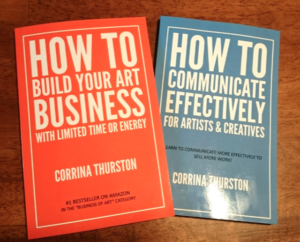 This is going to be the first time ever that my first two books, How To Build Your Art Business with Limited Time or Energy, and How To Communicate Effectively – For Artists & Creatives, will be available in paperback form! In August of 2017, I released my first book as an e-book. I had no idea how it was going to do or if anyone would care it existed. But I felt the NEED to write it. I felt the NEED to get those thoughts out on paper and then share it with the world. Little did I know that within six months that e-book would become a #1 best-seller on Amazon in the Business of Art category and be listed as one of the Best Books for Artists on the Artsy Shark website! The response was amazing and readers from around the world started reaching out to tell me how much it was already helping them with their business and work-life balance. It was incredible, and some of the comments I kept getting the most were about my writing style. People kept telling me how easy the book was to read, how well I simplified things to make them doable, how articulate, warm, and conversational my writing was. Then I was asked to give a few speeches on the subjects within the books and I was told the same things: my speech style was conversational, accessible, warm, and friendly. I was told that I was articulate and comprehensive. This gave me a thought. Perhaps my next book should be about: Effective Communication. Communication, in any form, can be a difficult thing to learn, especially for those of us who like to express ourselves in other creative outlets, like art and music. So I once again got to writing and released my second book as an e-book just this past September (2018). Immediately after release I had a list of emails from people reaching out to tell me how much they were enjoying it, how helpful it was, and how they were going to spread it around to their creative and non-creative friends alike! If you’re like me, e-books are fine, but what you really want is a good old fashioned BOOK in your hand. You want to be able to smell it, feel it, write notes in it, and access any page you want without a struggle or needing a device to get to it. You want something you can show people, lend to people, something that feels real. Well, thanks to the sales of the e-books, I was now able to bring my first book to life as a paperback! Excited beyond measure, I got to work formatting the files and signing contracts with my publisher, Onion River Press. After weeks of work, we submitted the book to the printer for a proof and I started playing around with the idea for a book launch party. Then it struck me. Should I also be doing my second book at the same time, or wait a few months? It was already published as an e-book. I had the formatting and design for the printed versions fresh in my mind. We decided to try and what had taken me a month to do for formatting the first book for the printed version, I now had to do for the second book in a week. Meanwhile I had received the proof for the first book and had to read through and edit that whole book to make sure it was set for printing. It was a loooooonnng week. By the end, we scrambled to get everything done and were successful in getting both books printed at the same time, and both in time for the book launch party I had planned for December 5th! At a past art reception. Now that the books are set, it’s time to celebrate! And I want to do so with as many of my friends, family, and fans as I can! So where better to do it than where I have my artwork on the walls, where they serve great food and warm, cozy beverages? There will also be a brief READING from one of my books likely around 5pm where I will stand up and give a short thank you speech and then read a passage from one or both of the books. If you’ve read the books and have a suggestion for which chapter I should read from, I encourage you to leave a comment or email me! Have I mentioned there may also be cake? Yes! I mean, what’s a party without cake?!? PLUS, the first 50 people there will get a free bookmark with my wildlife artwork on it! That’s okay! There will be lots of pictures from the night shared on my Facebook Page here, so you can enjoy it vicariously and celebrate with me on there, and you can also PRE-ORDER either or both of my books here! After the December 5th launch, the books will be available on my website, but until then, if you can’t make the launch, you can absolutely pre-order your copies! Have questions or comments? Feel free to leave a comment below or email me!